Craftsman Style Hillside House Plan 85480 is positioned on a steep sloping lot that affords a peaceful view over the lake. The total living area is a generous 4304 heated square feet including 4 bedrooms and 4.5 bathrooms. When viewing this home from the lake side, we see an outdoor terrace enclosed with arched stone pillars that make up the lower level foundation. A spiral staircase leads to the upper level deck which features rustic support beams. Driving up to the home is equally charming as you take in the special features of the exterior. Siding is comprised of cedar shingle and stone, and a country style cupola is positioned over the roomy, three car garage. Depending on the season and climate, you may see flowers growing on the pergola beside the front porch. This design would be equally “at home” in a mountain terrain. The master bedroom dominates the left side of the main floor. 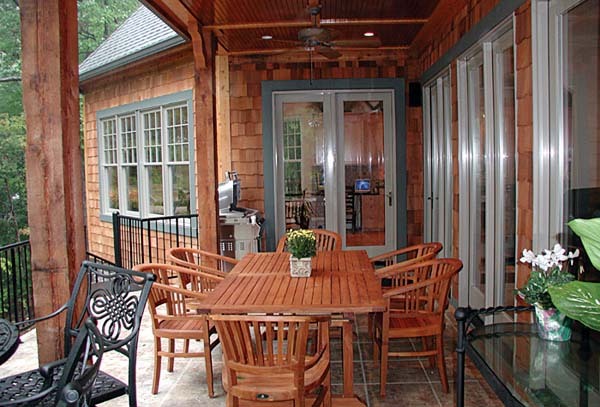 Windows on the front porch allow natural light into the master bathroom, and occupants enjoy his and her closets, double sinks, shower, bathtub, water closet and laundry closet. The main bedroom is dressed up with a tray ceiling. Three arched entryways open to the family room from the hallway. Inside, the room is set up with a fireplace and plenty of windows for a view of the covered deck. 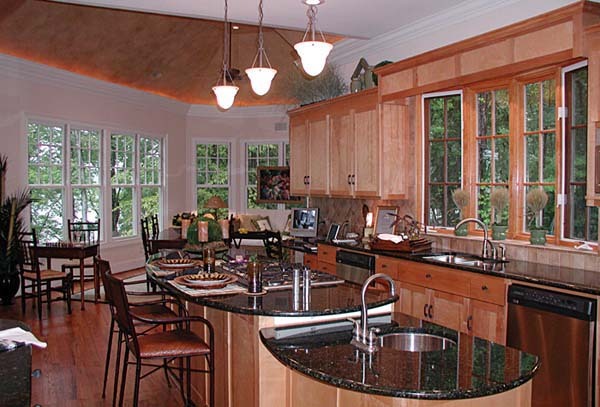 The photographed kitchen in the finished home shows beautiful wooden cabinets with attractive granite counter tops. From the breakfast room, we see the angled walls are composed mostly of windows as they stretch into the sun room. Here, you will enjoy a panorama of the lake or mountains. Moving upstairs, we find a huge bonus room with full bathroom which gives your guests a nice place to find privacy and rest after their travels. For the remaining bedrooms, we head downstairs to the lower level. Noted on the floor plan are suites 2, 3 and a guest suite with two more shared bathrooms. Matching the family room above is a recreation room plus wet bar and winery where you will enjoy entertaining. Click here to see the plan specifications and more interior photographs. Hello, no I’m sorry I was not able to find it. You might find something similar in our Hillside House Plans.